France is famous for its gastronomy, and Paris, being its capital, no doubt has some of the best French restaurants in town. However, we understand that one might not be in the mood for cheese and wine, or even their delicious garlic escargot all day, every day. And sometimes, we just desperately crave the exotic food that we’re used to having back home or elsewhere. 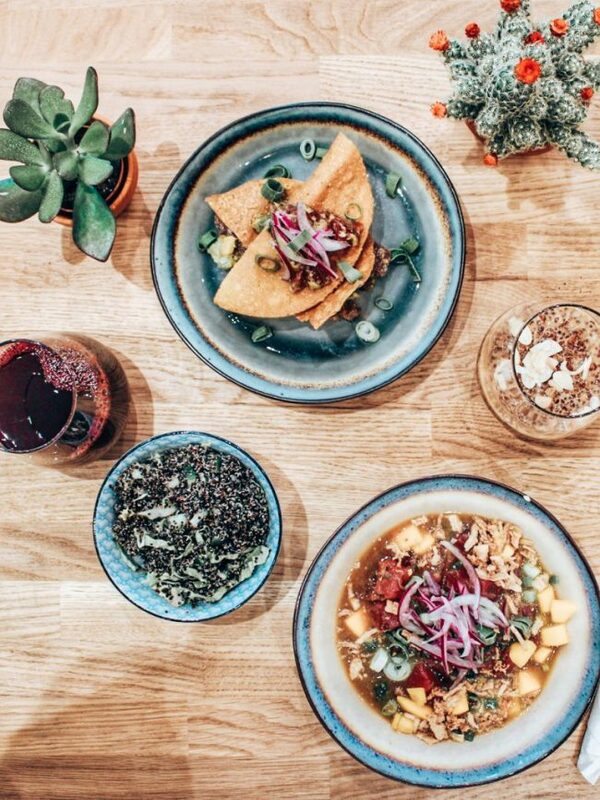 We know what it’s like, so, we’ve compiled a list of top five non-French restaurants in Paris that serve anything but French food to help you satisfy those exotic cravings. This family-run restaurant is like your normal family dining room, but better. The place is warm, spacious and homely, no wonder it fills up almost instantly as it opens its door at noon. 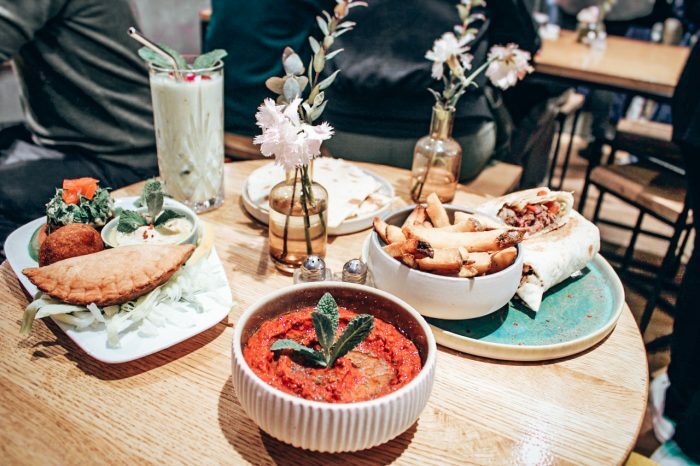 The smell of fresh Lebanese and Syrian food is inviting and the whole place is filled with a delicious aroma of their homemade bread straight out of the saj, an oven responsible for all the delicious wraps, and the inspiration for the name for the restaurant. The owners are two passionate brothers and the main chef is their mother, which make sense since mothers are the best cooks. Here at COOK’N SAJ, everything is made to order, using the freshest and highest quality produce. Plus, with the supervision and quality control by the head chef, satisfaction is guaranteed. Also, shout out to COOK’N SAJ for using stainless steel straws! We love a good sustainable and responsible kitchen! 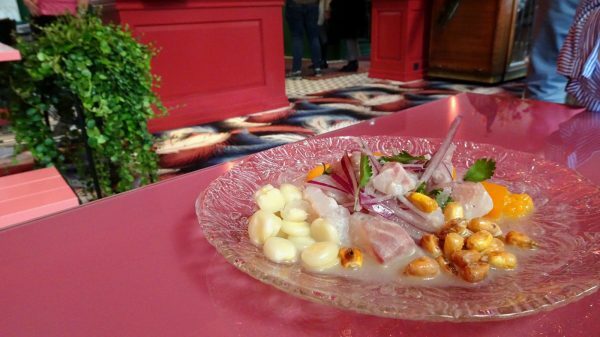 This one is for not only Peruvian lovers, but also lovers of fine dining. Realising the majority of Peruvian food are enjoyed almost exclusively in the evening, MIKUNA is committed to making this refreshingly delicious cuisine accessible to all, serving fast but carefully crafted ceviches, alongside a variety of hot dishes, straight out of their South American kitchen both for lunch and dinner. Every bit of the place is inviting and radiates happiness, from the menu to its interior design. The owner has clearly planned all of it with such close attention to details. Despite having opened its door three weeks ago, MIKUNA has already gained a steady customer-based. This isn’t a surprise considering how truly wonderful their food is. 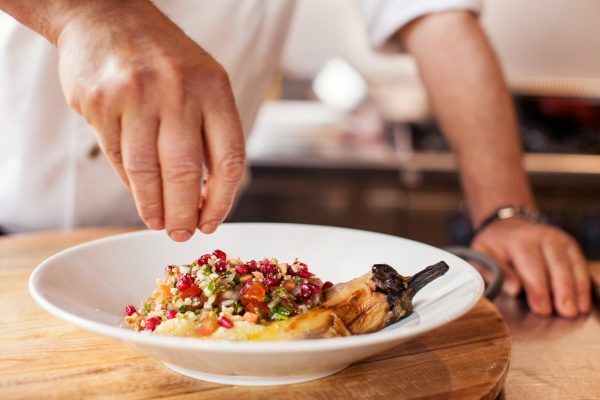 The menu is refreshingly creative, as the chef adds a Latina twist to the classic French dessert, crafting the most delicious dulce de leche pudding, quinoa au lait. 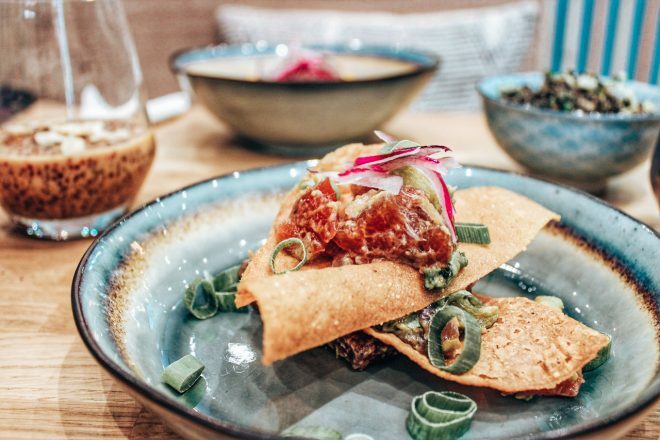 Thanks to MIKUNA, you can enjoy quality Peruvian dishes that one would expect only from fine dining experience without draining your wallet. Despite the overwhelming collection of Asian restaurants in Paris, not many, I’d say, is indeed authentic. 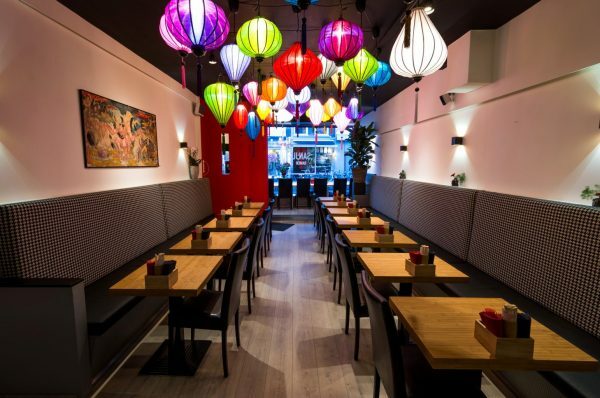 21g-Dumpling is here to serve you some proper Chinese and Taiwanese food, with a delicate French twist to it (I know, I said no French, but trust me, this is good!) 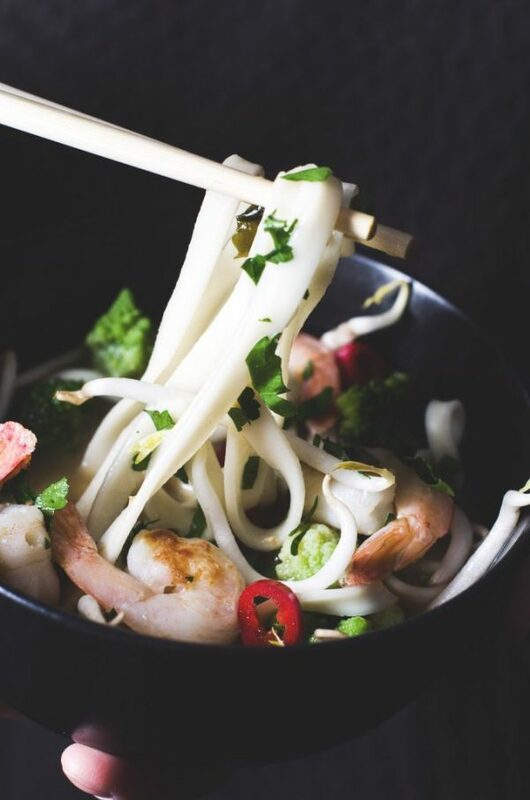 Located in the 11th arrondissement, 21g-Dumpling is guaranteed to satisfy your cravings, because, who doesn’t love a good Chinese meal? You can’t leave Paris without visiting the Grand Mosque, which is conveniently located next to the Natural History Museum and the Jardin des Plantes. Not only is it the biggest mosque in Paris, but it has also a beautifully decorated restaurant serving authentic Moroccan and Middle Eastern food. 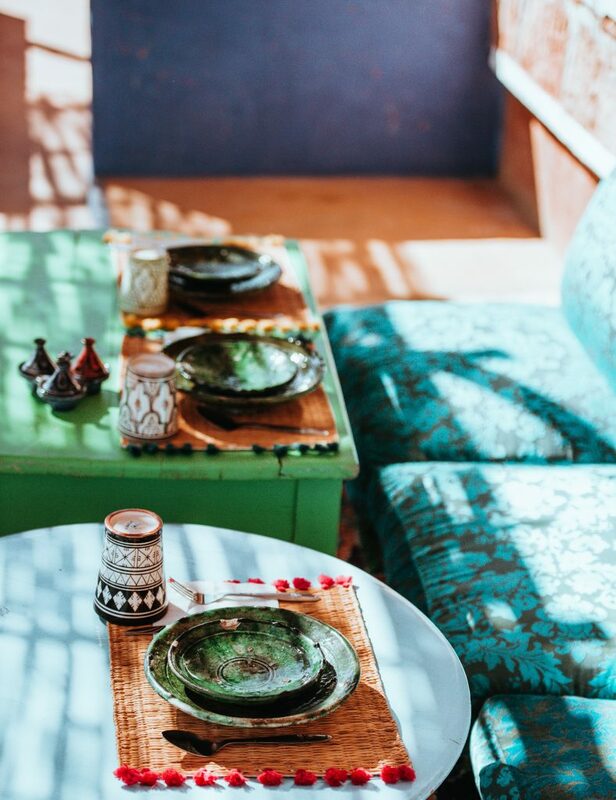 The setting is absolutely stunning and even if you don’t want to commit to a full meal, make sure you grab one of their sweet pastries at the front and get yourself a glass of their mint tea. Feel like you are in another world, only in Paris! The street behind Palais Royale is packed full of Japanese restaurants. The selection is overwhelming but worry not, Dosanko is the only place you need to go to for the perfect bowl of ramen. A small corner restaurant, you will often find a queue outside this little place and for good reason. The portions are big and the quality superb, Dosanko is definitely one of the most authentic Ramen places in Paris. 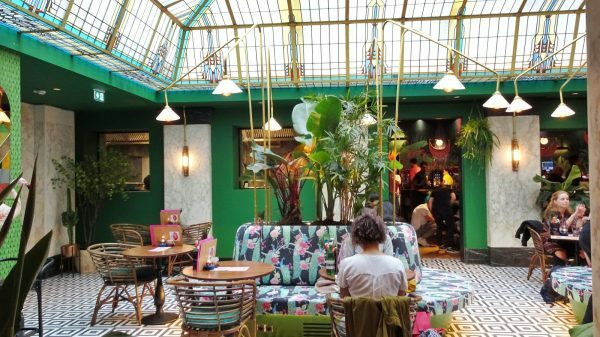 With these five exotic restaurants on your list, I’m sure navigating the non-French food scene in Paris has just gotten much easier, seeing how many options there are in the city! Let us know what you think if you end up visiting any of them! *Chantelle is one of our guest editor from Hong Kong. She has lived in three different countries and have travelled across many continents. Having been in England for the past nine years and graduated with a Law degree, she is now taking a break in Paris for the year as she figures out her next step in life. Always passport ready, she is an expert at traveling light and on a budget, although she still enjoys the occasional indulgence in a luxurious holiday. You can follow her on Instagram. 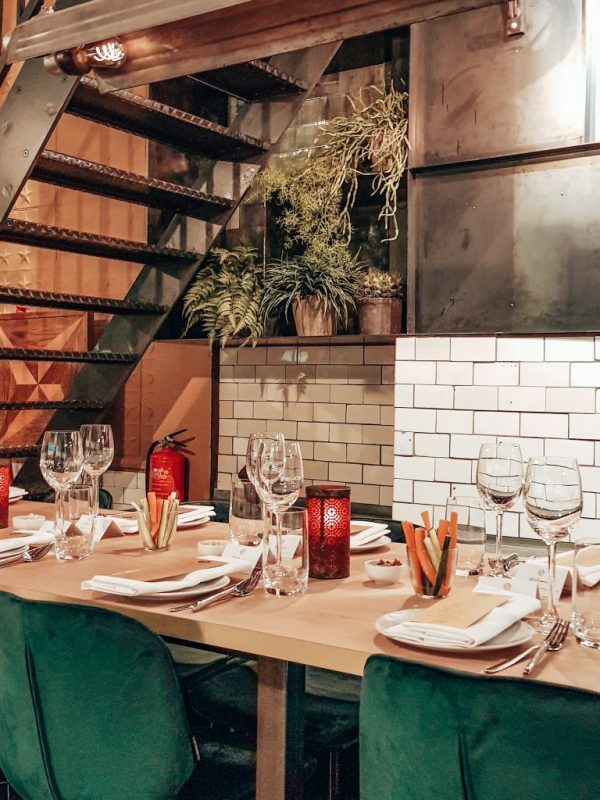 Libanese restaurant Fenicie opened it’s doors in the most lively district of Amsterdam last night. The Libanese cusine is more popular than ever, but to do it right, you must have a killer hummus. Did Fenicie live up to our expectations? 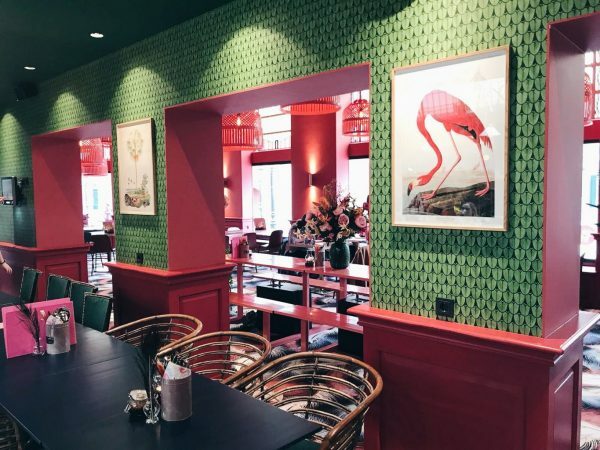 Fenicie is located next to Palladium near the Leidse Square and has taken over the former Ron Gastrobar Paris. 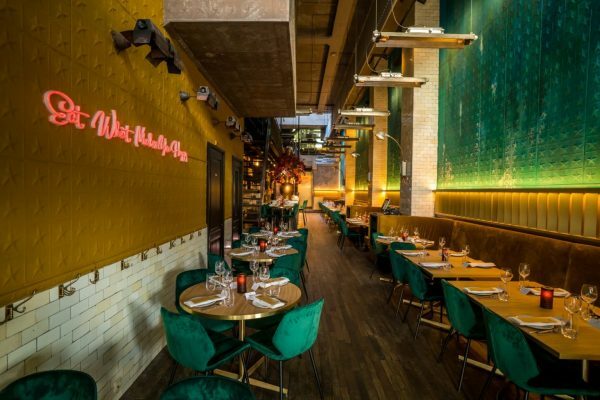 The 460 m2 restaurant has 2 entrances, one at the Korte Leidsedwarsstraat and one at the Kleine Garmantplantoen. 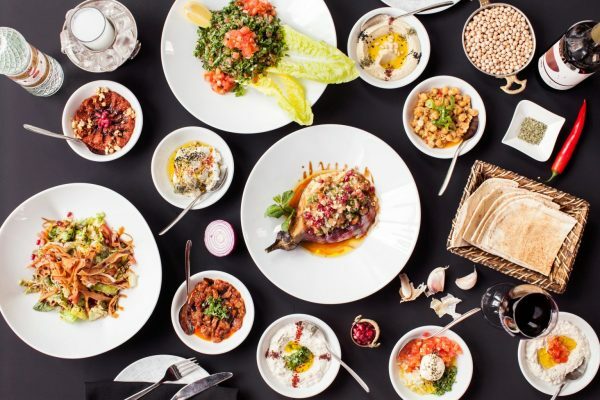 “Bringing the best of Lebanon to Amsterdam” is the mission of restaurant that already has a location in Purmerend that has been around since 2016. There are 120 seats available and it’s going to be the ultimate shared dining experience and it can also perfect for drinks with friends. Our first impression when we walked in was that the building has an industrial look but it’s done with middle Eastern elegance but doesn’t feel too posh. (like the next door neighbour Palladium). Hummus, falafel, tabouleh, baba ganoush and kibbeh, probably dishes you have tasted or heard of before. But if you want to taste the traditional flavors, you need to taste the Meze that Fenicie serves. For example the muhammara that has been roasted for 12 hours and a killer hummus with a preperation of 24 hours! 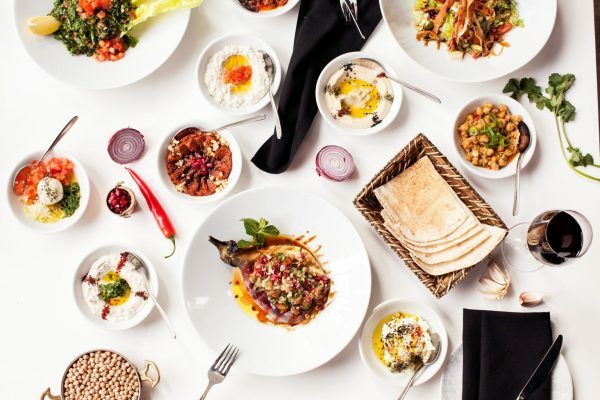 (we didn’t even realize this was the proper way to prepare it) Good to know: The Libanese cusine is perfect for vegans because vegetables, granes and fish take the centre stage on the menu. Yes, there is meat on the menu but it’s not the most important dish. You can take a seat at the chefs table which is located right across from the kitchen and is available on request. During the weekend Fenicie will turn up the music, move some tables around and turn it into the perfect spot for cocktails, which you can enjoy until 3am. Having experienced one of the longest summers last year, Fenicie is clever enough to include an outside terrace that is great for people watching along the streets. Because the space is so big, they will open a second restaurant in the same building. It’s a clever move, because previous entrepreneurs in the same building didn’t make it past the 2 years of opening. The Burger Fabriek on the other side will serve burgers (hence the name) and you can enter this restaurant via the Korte Leidsedwarsstraat and is meant for people that want a quick bite and a beer, focusing more on tourists. On a personal note, we can’t say we are too exited about that, because we feel like meat is something we all should consume a little bit less of. 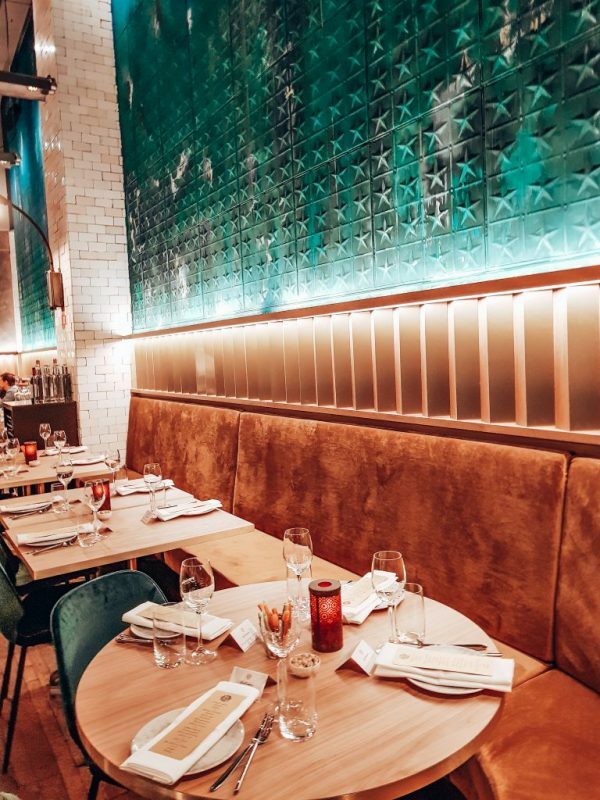 I loved the space and interior design, the mint green tiles on the wall, and the high ceiling. We were welcomed with an alcohol free cocktail and the DJ was playing Middle Eastern style house music. Unfortunately we had to wait for almost 2 hours before the food arrived, but after some sincere apologies (due to some communication with the kitchen), they made up for it by serving a table full of cold and warm Mezze. I tried the hummus first of course, and although I’m not a hummus expert, I thought it missed some flavor, maybe the lemon? The Baba Ganoush and Muhammarah however, was out of this world! We tasted around 15 different dishes and yes, I tried most of them (except the meat). TIP: if you decide to go for dessert, you MUST try the Knafeh, which is crispy vermicelli dough with cheese and ice-cream. A-MA-ZING. So would I return? Yes. And if I do, I will take a group of friends because it’s perfect for that. Eating, drinking and chatting until the early hours. I think Fenicie is going to be around for a while. 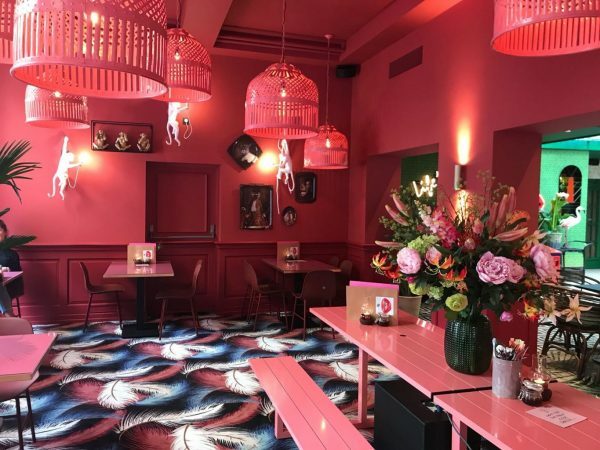 The Streetfood Club » a new colorful hotspot in Utrecht! Ladies and gentlemen, there’s a new club in town. The Streetfood Club is the place to go to if you want to enjoy various yummy streetfood and cocktails, and I haven’t even started about the interior. 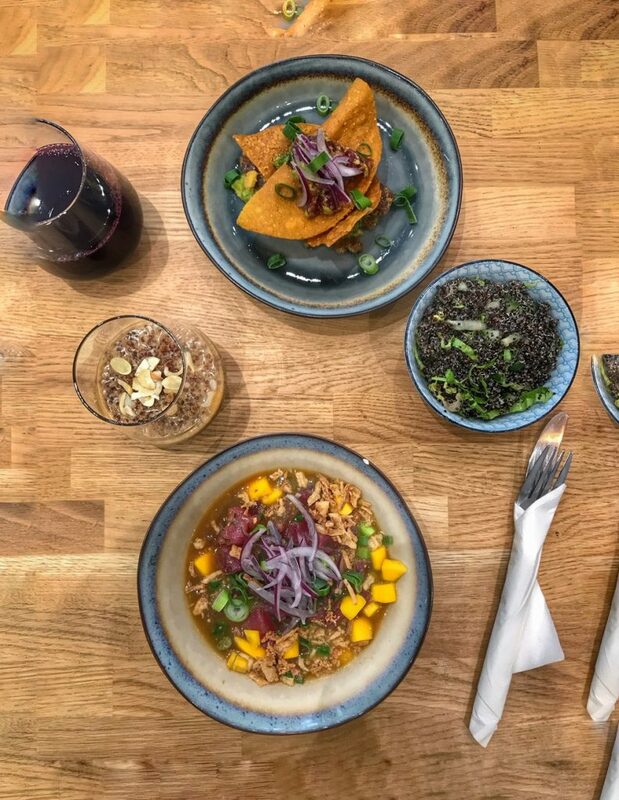 The Streetfood Club is located at the Janskerkhof in Utrecht and the food is mostly inspired by the Asian and South-American cuisine. 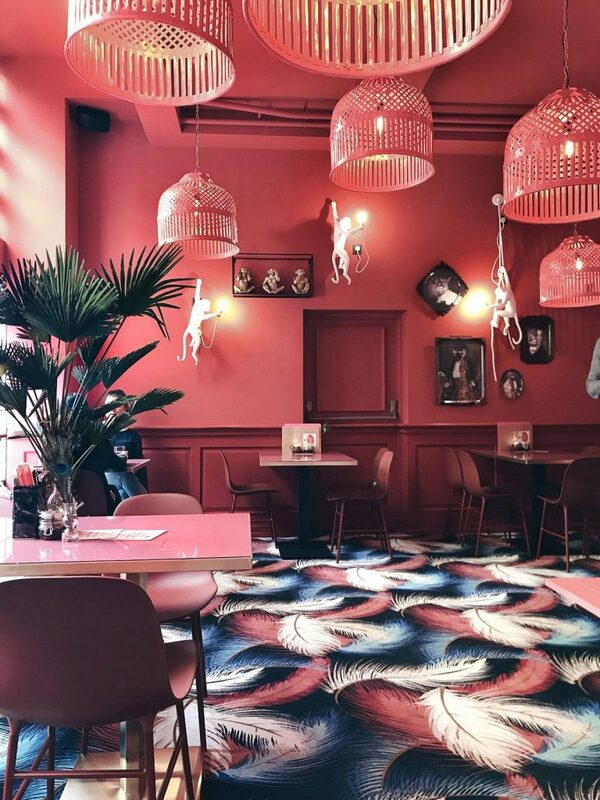 You’ll be amazed from the moment when you set foot in this place because interior is a dream for any Instagrammer. Inside the club are three different areas. The first one is completely covered in pink. Pink chairs, pink tables and even the walls are pink. 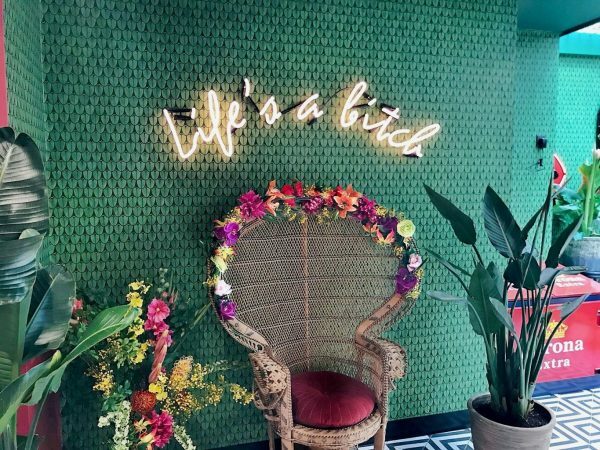 The second and third spaces are covered with tropical wallpaper, cozy chairs (with crazy prints), neon lights, flowers and many other nice decorations. The second space also has a big traditional glass ceiling, which gives a nice vibe to the place. The club is of course not only a place to look at, but also for enjoying an international dinner with a variety of flavours. 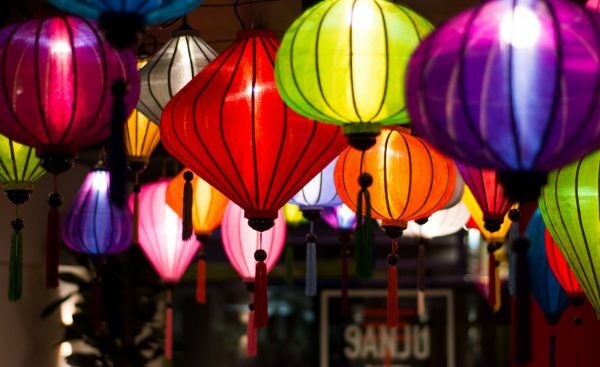 They offer a wide variety of streetfood, ranging from crispy prawn balls to gado gado and from fresh spring rolls to beef curry. They also serve dim sum, many salads, kitsune udon, gyoza ravioli, crab cakes and oysters. The portions are small, but each dish is high-quality and tastes delicious. Each dish has its own unique, special flavor and it’s quite hard to stop ordering more. Four or five dishes per person will be enough to make you fulfilled. I personally loved the seabass ceviche, the crispy prawn balls and the sweet potato fries. If you can’t make a decision between all the tasty dishes, don’t worry! You can order a surprise menu and they will serve you a selection of their favorite dishes. But…it doesn’t end here! 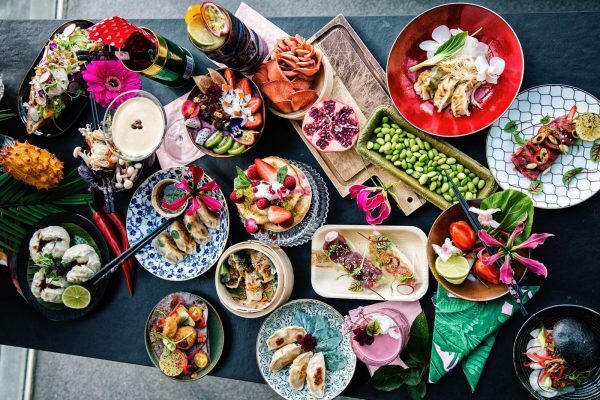 You can go to The Streetfood Club for an amazing brunch from 10 AM till 4 PM. If you have a sweet tooth, you can order a donut with ice-cream, French toast with maple syrup, matcha pancakes with chocolate glaze and honeyed pistachios or kimchi waffles with fried chicken and maple syrup. They also serve a variety of luxurious sandwiches, truffled eggs, pokébowls and salads. How about a Hello Kitty Cotton Candy Milkshake? The Streetfood Club doesn’t only serve streetfood, they also have a nice variety of “special” cocktails. How about a Hello Kitty Cotton Candy Milkshake with rose extract, lime juice and cotton candy? Or a Silk Road with vodka, kumquat and pomegranate juice? 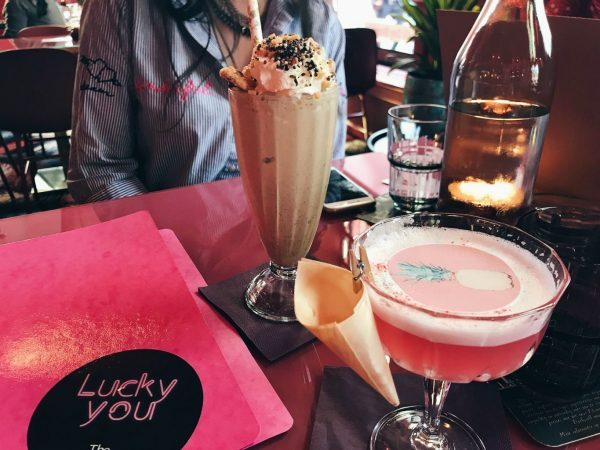 If you are in the mood for a milkshake kinda cocktail, then go for the Hazelnut Heaven spiked with ice-cream, chocolate chip cookies and Baileys. The cocktails are not standard at all and they are all made of a special mix. 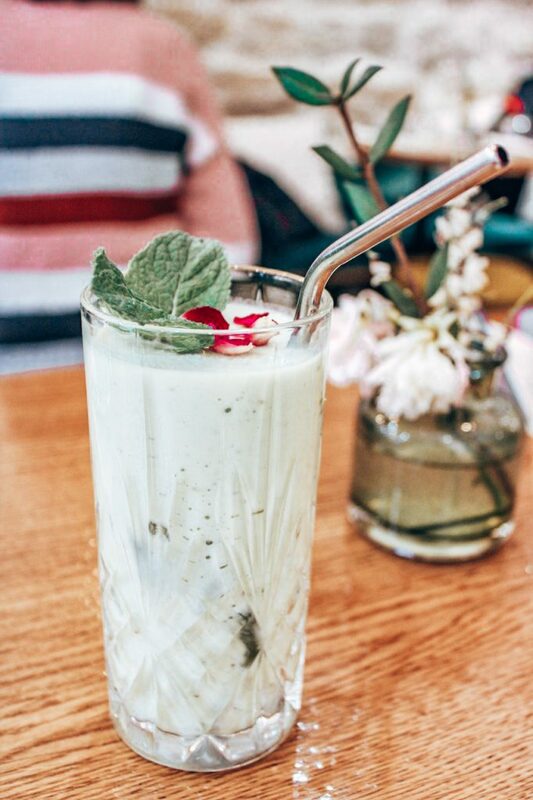 The best thing about the cocktails is that the people at the Streetfood Club create their own spirits, liqueurs and syrups. And if you’re not in the mood for alcohol, you can enjoy a Kingston Town drink with pineapple juice and rose water, a Prince Harry of England iced tea with ginger and mint or a freaky milkshake. Yes, this is going to be THE place to be in Utrecht, with people all over the country coming over to check it out. The Streetfood Club is having their try-outs nights until the 6th of April for people who want to get to know the menu. Check their Facebook Page for more info. Sanju Ramen is all about the Japanese broth that is getting more popular by the day. 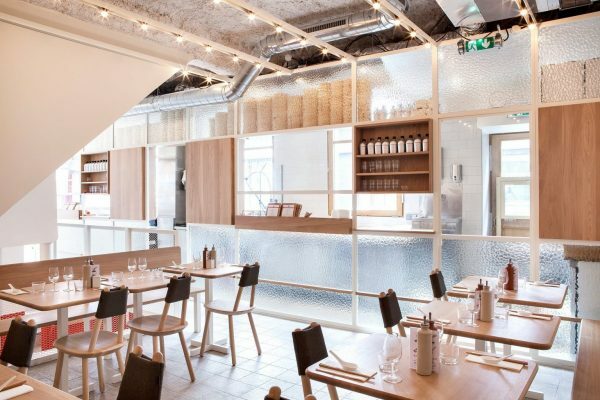 They opened back in January 2018 at the up-and-coming Voorstraat in Utrecht, and serve typical Japanese soul food. Co-owner, (and ramen lover) Jeroen invited me to the restaurant and told me all I needed to know about Japanese ramen. 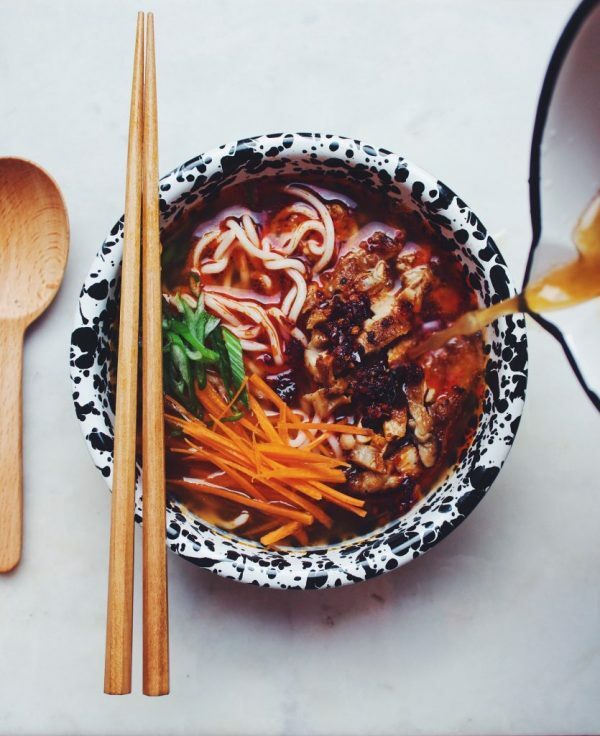 Ramen is Japanese noodle soup based on chicken, pork or vegetarian broth. This bouillon will be cooked for approximately 8 (!) whole hours to create a juicy and tasty soup. It is thus quite a lengthy process to create one cup of ramen. The ramen soup is full of flavor because it has been cooking for so many hours. It tastes very salty and it’s seasoned with many different spices. Jeroen told me that Japanese people eat ramen almost every day. In the open kitchen you can find many Japanese chefs who have been living in the Netherlands for a few years and who know everything to make the delicious, traditional Japanese ramen. 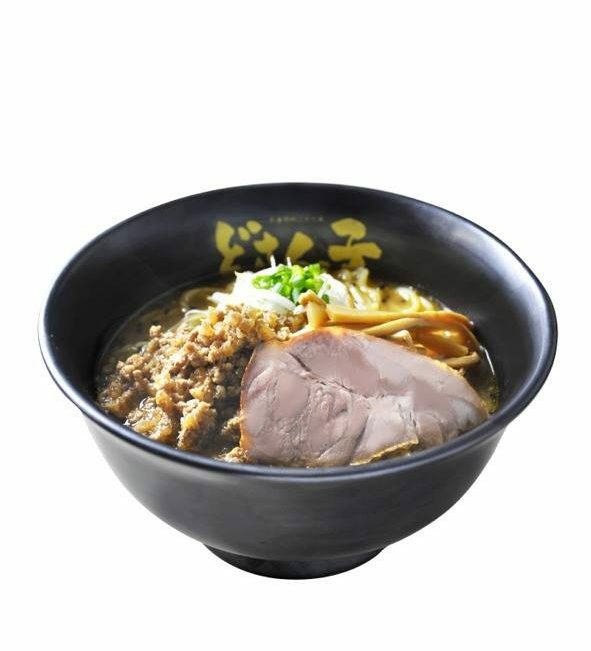 You can get all kinds of ramen at Sanju Ramen, try the Hot & Spicy with chicken and roasted jalapeno peppers, or the Pork Miso Tonkotsu with pork (hence the name), creamy broth, corn and green onion or go for the Sanju Classic with homemade miso, chicken, corn, onion and nori flakes. It was the first time I’ve eaten ramen and I ordered the Pork Miso Tonkotsu, which was delicious, creamy and really tasty with nice, tender pork meat. Sanju also serves vegetarian and vegan options on the menu, something you see more often, even in Asian style restaurants. This is quite unique since the traditional ramen are most of the time made with either chicken or pork. It takes two whole days to make the vegetarian or vegan soup. At Sanju Ramenyou can also order baked dumplings, deep fried chicken or edamame as side dishes for the full Japanese experience. If you like your ramen, slurp loudly so the chefs in the open kitchen can hear you enjoying your dinner! *Merel is one of our guest editors from Utrecht and describes herself as a daydreaming student who has wanderlust ever since she traveled sround Jamaica for 3 months. She can’t wait to travel the whole wide world after she finishes her bachelor. Follow her on Instagram!